In this page, Authentic Stone Creations – conveniently located in Lexington, Kentucky (KY) – is here to tell you about the professional excavation services we offer. Contact us today for all of your stone and masonry needs! Excavation is a process that involves the removal of rock or soil in order to form a trench, tunnel, an open face, hole, or cavity. This can be achieved through the use of machinery, tools, or controlled explosives. Digging up the ground is necessary for a variety of masonry construction projects to create a stunning final product. Contact Authentic Stone Creations to learn more about the excavation services we offer to Lexington, KY.
A level surface is required to ensure that the stones remain equal when being laid. 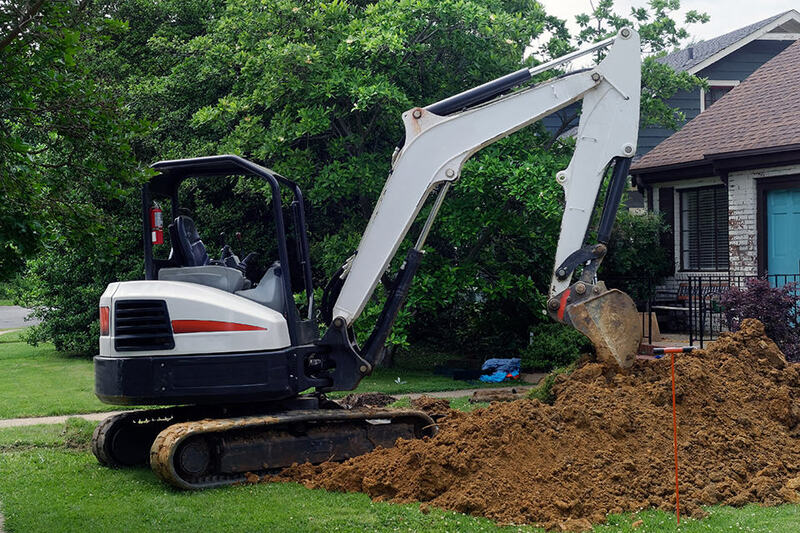 We perform excavation services so that all of our projects have crisp lines that are parallel to the ground. Uniform masonry is essential in crafting a beautiful structure that will stand the test of time. Our team of professionals has received thorough training on safety practices that must be utilized during the course of excavation. Before allowing the digging to commence, information regarding the essential underground services in the area where the work is going to be carried out is first collected. The location for excavation is scouted for the presence and depth of any cables, pipes, or other elements of an essential service that can be affected. We perform this research prior to breaking ground to ensure the location is suitable for excavation work. This is why it is beneficial to rely on a professional for this service, for absolute certainty that nothing located underground will be damaged in the process. At Authentic Stone Creations, our team has offered numerous types of masonry construction projects for both residential and commercial properties for over two decades. We work with several materials including brick, natural stone, cultured stone, block, and concrete for our jobs. Our design team will help you to turn your vision to be realized and to make sure your masonry project is perfect for you. We are located in Lexington, KY to provide our masonry services to the surrounding area. Call us today to schedule an appointment.